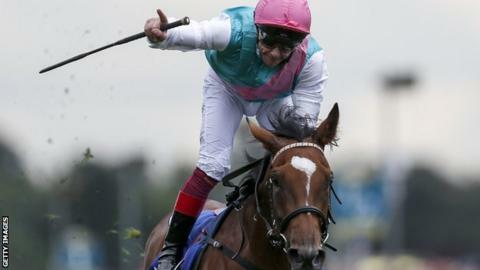 Enable marked her return to the track with victory in the September Stakes at Kempton. Under jockey Frankie Dettori, the filly was making her first start since winning the Prix de l’Arc de Triomphe last October. The John Godsen-trained Enable quickly moved into the lead in the four-horse race. Crystal Ocean was expected to provide a tough challenge but could not keep up as Enable sprinted to victory. She is now expected to defend her Prix de l’Arc de Triomphe title on 7 October. The Tin Man won the 32Red Sprint Cup at Haydock as 6-4 favourite Harry Angel ran out of steam in the final furlong. Under Oisin Murphy, The Tin Man won by half a length from Brando and Gustav Klimt, with Harry Angel, one of racing’s leading sprinters, finishing fourth. Dettori had been scheduled to ride at Haydock, but had to abandon those plans when the landing area at the course was closed after a plane skidded in wet weather.